Are you looking for nutrition and fitness content for your publication? I specialize in taking complex topics and translating them into practical, understandable, applicable advice. I cut through the pseudoscience and misinformation to bring meaningful, valid content to your audience. Click here to see me quoted on Food Network. Click here and here to see a sample of my work as a regular contributor to Willamette Living Magazine. Click here to see my contribution to Portland Sports Psychology monthly newsletter. Click here , here, and here to see my contribution to Rock and Ice (online climbing magazine). Click here and here to see me quoted on Popsugar. Click here to see me quoted on UnderArmor’s MyFitnessPal blog. Click here to see my article on nutrition for high altitude for Backcountry Foodie. Click here to see me quoted in Up Journey. 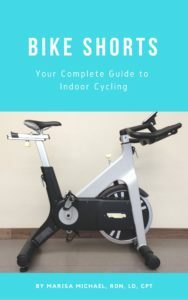 Click here to view my book Bike Shorts: Your Complete Guide to Indoor Cycling. Contact me for inquiries, pricing, and services at dietitan@realnutritionrdn.com.